Doing Nails: An Ancient Southeast Asian Art? 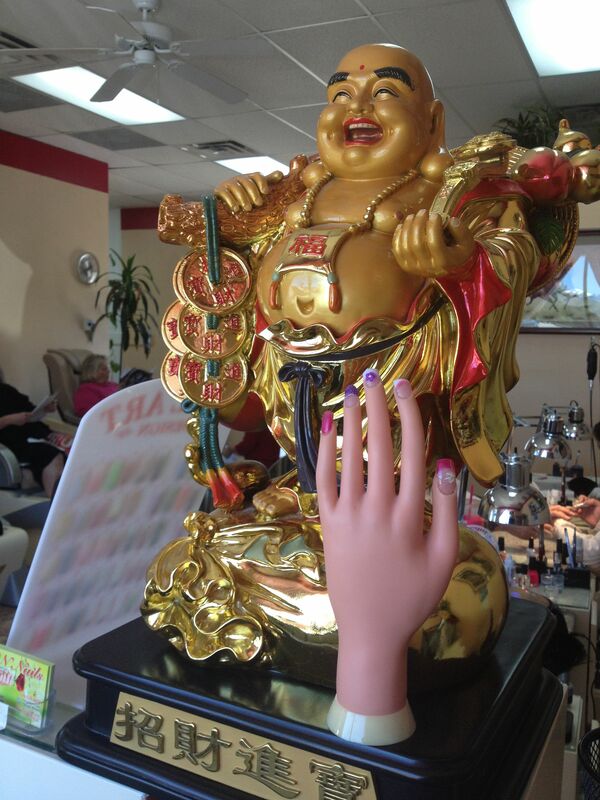 The Buddha and creepy hand at VN nails. According to the 2012-2013 Industry Statistics published by Nails Magazine, 48 percent of nail professionals in the $7.47 billion US nail industry are Vietnamese Americans. The number skyrockets in California where Vietnamese Americans represent 80 percent of the state’s nail technicians. Having lived in Southern California and also wanting to visit Vietnam, I’ve been fascinated with this phenomenon for years. 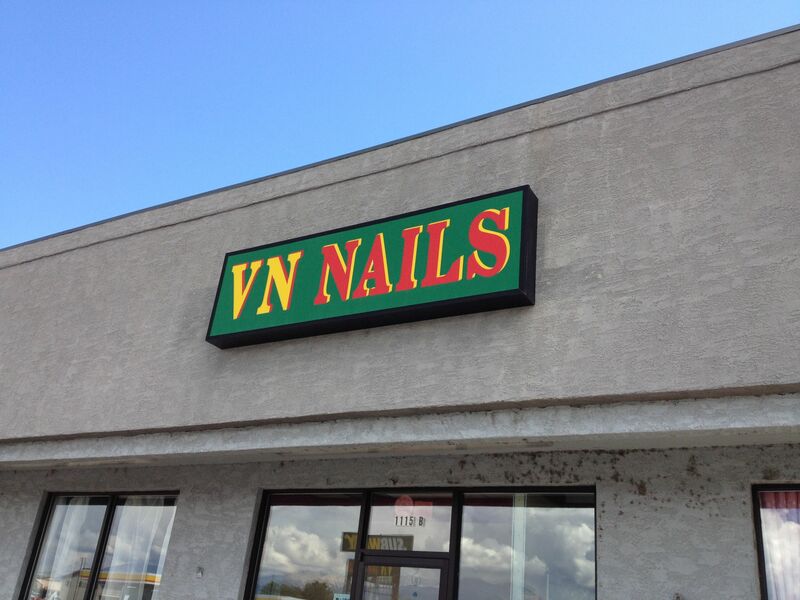 The somewhat sad looking complex where VN Nails is located. I arrive for a pedicure at the new Salida salon, which is located next to a Subway and a storage unit rental place. Nearby, Methodist Mountain’s changing aspens decorate the landscape like drops of O.P.I.’s Glitzerland Yellow Shimmer Nail Lacquer. Inside VN Nails, you find the standard salon accouterments, including vibrating massage recliners, ferns, stacks of People magazines, heated nail dryers, and shelves of O.P.I. polish. The elevator version of “Hey Jude” plays on the sound system, and a gleaming gold Buddha near the register catches my attention. Chinese script decorates the statue’s base, and a somewhat creepy plastic hand, displaying various nail colors, reaches up toward the happy, paunchy Buddha. Perhaps this practice of pampering goes back to Buddha’s times. I wonder if villagers massaged the hands and feet of traveling monks. The Vietnamese probably embrace this tradition in the same way the Chinese revere acupuncture. Finger and toe tending in Vietnam must be another old school Asian art like grooming bonsai trees in Japan. “Hello,” VN Nails owner Giao Huynh, who goes by “Gina,” greets me from her manicure station. Pulling down a white surgical facemask, she smiles, and says, “Pick out a collar.” The salon is busy. Another customer enters and greets Giao and her husband. “Hello, Barbara.” Giao’s eyes crinkle as she smiles from behind her repositioned mask. “Tony,” also wearing a surgical mask, buffs the nails of an aging hippie. Even in a bulky sweater, Tony looks like a doctor performing a delicate procedure. I notice Giao’s diploma from Colorado Beauty School on the wall. She and Tony probably had to get American credentials before they could open their business. In Vietnam, however, the knowledge of this time-honored tradition surely must be passed down through the generations. Holy Shimmer! Not Even Close. After doing a bit of research, I discovered that I was way off. The Vietnamese tradition of doing nails started in the United States in the mid 1970s. It’s a story straight out of Hollywood. Seriously. 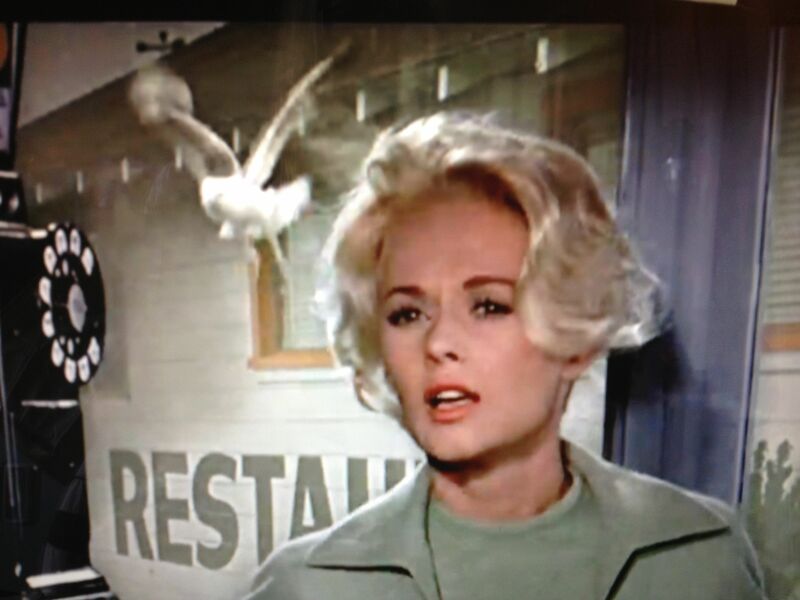 Tippi Hedren, who starred in Alfred Hitchcock’s 1963 classic, “The Birds,” was a volunteer with a humanitarian group that worked with Vietnamese refugees in Sacramento, California. Having escaped war-torn Vietnam, the refugees lived in a tent city, which the actress often visited. She especially connected with a group of 20 women. Tippi Hedren displays her nails while, from a phone booth, she wards off the birds. Going a step further, Hedren persuaded Citrus Heights Beauty School near Sacramento to enroll the Vietnamese women as students. While a Hollywood humanitarian got the ball rolling, ultimately, the Vietnamese immigrants and their families created a nail empire. Tam Nguyen, co-owner of Advance Beauty College (ABC) in Orange County, California, was one year old when he and his parents arrived in the US in 1975. Nguyen’s father, Diem, was a social worker and navy commander in Vietnam. His mother, Kien, was pregnant with his sister when they left Saigon. “My parents did come with nothing but the shirts on their backs. It was very dire and very difficult for the first few years in the mid 70s,” Nguyen says. Ultimately, Kien reconnected with a high school friend, Thuan Le, one of the original 20 students of Hedren’s manicurist, Dusty. Kien learned the nail trade and began supporting her family. The Nguyens owned a salon, but eventually they opened ABC in 1987. Today the school, with campuses in Garden Grove and Laguna Hills, has one of the largest manicuring programs in the country. The Garden Grove campus even offers classes both in English and Vietnamese. “We’ve graduated over 30,000 Vietnamese nail technicians over the years,” says Nguyen who began working at ABC in 1999, and with an MBA, he now co-owns the college with his sister, Linh. Sitting in the vibrating recliner, I place my feet in the hot blue water, which feels soft, almost silky. As Giao removes old polish from my toes, I talk to her about Vietnam. I ask her what she misses. “Talking to people. My language,” she says. Clipping away, she works on my gnarled little toe, which many years ago, had an unfortunate encounter with a sofa. “I’m sorry, that toe is kind of messed up,” I say. “It’s okay. It’s okay.” Without her mask on, Giao reveals her broad smile. She rubs my feet, and then gazes off toward the wall. I wonder if she’s thinking about Vietnam. Or maybe she is grossed out by my jacked up toe. Shortly, she looks back at my feet. Toes must be treasured in Vietnam. Really wrong. Actually, feet are not particularly celebrated in Vietnam. In fact, showing your feet to someone in Southeast Asia is very offensive. That, of course, is unfortunate for someone doing pedicures for a living. It’s like having someone flip you off all day long. “I’ve met immigrants who were professionals in Vietnam who worked in offices and worked as teachers or professors or engineers. They get into doing nails, and they are completely not okay with doing pedicures,” says Nguyen. On the other hand, many Vietnamese immigrants adapt. “Obviously, the overall riding priority is to make a quick transition to American society, to a new country and get a good job and to start providing economically to the family. And working on feet becomes a very minor thing,” adds Nguyen. 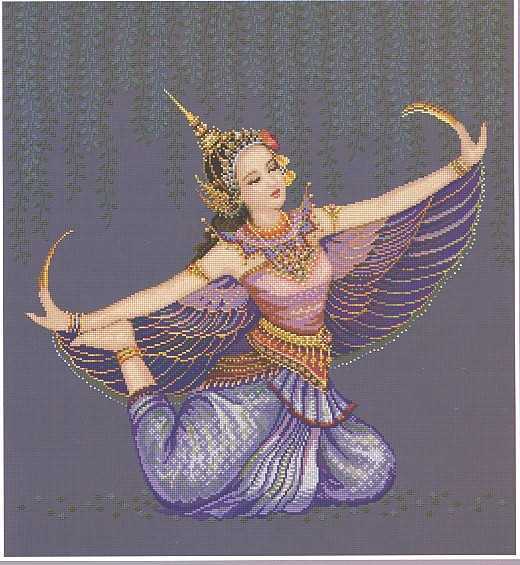 Images like this, albeit of a dancer from Thailand, helped add to my misperceptions about nails in Vietnam. Are Nail Salons Popular in Vietnam? “Does Tony ever do your nails?” I ask Giao. “Yes,” Giao says, but she explains that acrylic gels are not available in smaller towns. “Only in Saigon and Hanoi. They are big cities. Like New York,” she adds. While the Nguyens have achieved the proverbial American dream, they now are helping people achieve the Vietnamese version of the dream. “I often talk to my parents and they say we’re not only making an impact on giving back to the American society and the Vietnamese community in America, but now we going back to helping our homeland,” he adds. Would You Ever Go Back to Vietnam? Checking out my sassy blue toenails, I thank Giao and ask her one more question. “No,” she smiles. 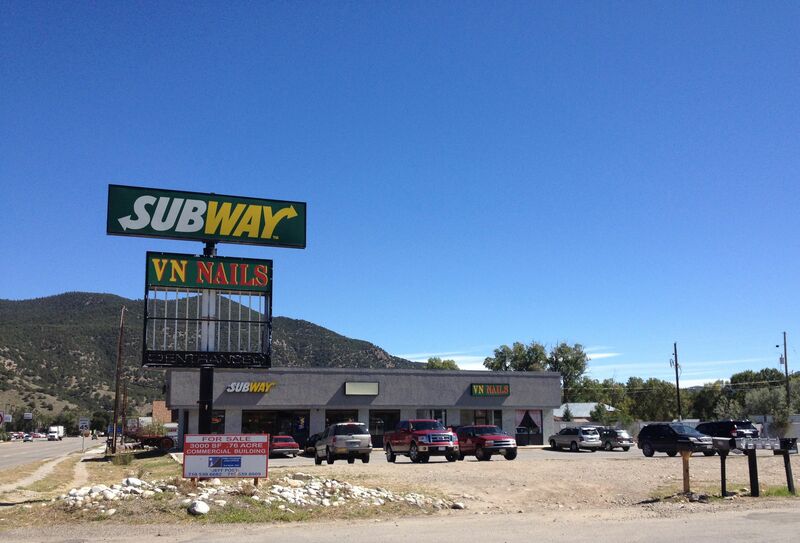 She and Tony are here to stay in Salida where they own the only Vietnamese American nail salon — for now. This entry was posted in Culture, Travel, Uncategorized, Vietnam and tagged nail salons, nails, pedicures, Tippi Hedren, Vietnamese American nail salon industry by stephglaser. Bookmark the permalink. Lottie! I’m so glad this is interesting to you. I was stunned when I looked into the history, and decided I wanted to assign myself a story. It’s been told, of course, but I really want to go to Vietnam (big surprise…I want to go to Southeast Asia) and see what’s happening over there in a full circle kind of way. Can you say “DREAMWEAVER”?! I’m actually quite interested in the fact that London has so many Vietnamese salons as well. Very fascinating that they are called “California Nails” and that they have the American connection! Perhaps I need to add London to the list on my story itinerary, and well, Spain is just a bit down the continent….. I could relate to many of the things you have mentioned like showing the feet as I come from Indian background and so many taboos and things that are accepted and not accepted there…how have you been dear? it’s been long as I was busy in other things in life so couldn’t get in touch earlier…hope thigns are good at your end. Kavita! I always enjoy your insights. I didn’t realize showing feet was offensive in India, too. I have so much to learn and Vietnam and India are places at the top of my travel list. Steph, it was so good to catch up the other day! I was so interested in your story on the Vietnamese nail industry that I searched for it on your blog. Don’t know how I missed it since I subscribe. LOVED reading the story! Is it weird and nerdy that I love your simile comparing aspens and OPI nail polish? I agree with welcometothefunhouse – it sounds just like you’re telling the story in person 🙂 Hope this leads to a trip to Vietnam!! It was awesome to talk to you, my friend. I’m so glad you liked this story (huge smile :)) and it’s not weird at all that you liked the OPI aspen comparison. (It’s nerdy, I suppose, that I thought of it in the first place) I was hoping someone would appreciate it!